Paper Sweeties March 2015 Release Party! Now, let’s get to peekin’! (Click on the photos to see larger views). Creating adorable little scenes on my cards using the Sweeties paper dolls and fun outfits + accessories is one of my favorite things to do! It brings me back to my childhood days when I would play with paper dolls for hours on end! I’m a grown up girl now, but still a kid at heart, so working with these fun products is so enjoyable for me! 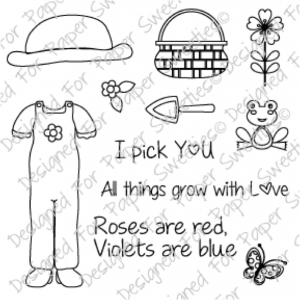 On today’s card, sweet little Emma is dressed in her newest gardening outfit and she has picked a basket of flowers fresh from her little Sweeties garden! I used a number of stamps and dies to create today’s bright and cheery card. 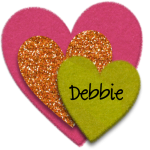 I L-O-V-E to paper piece too – so yummy to mix and match pretty patterned papers! 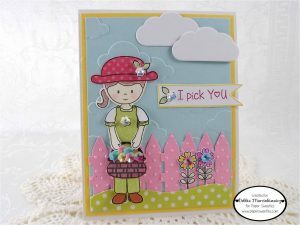 Play along with the March Inspiration Challenge ‘Waiting For Spring‘ – for a chance to win a shopping spree in the Paper Sweeties shop along with a Guest Designer invitation to join us for the next challenge! Subscribe to our newsletter to stay up-to-date with everything new and exciting at Paper Sweeties! Like our Facebook Fan Page – $20 gift certificate given out to one lucky fan each time we reach 100 new ‘likes’ — next prize level at 2,000! Be inspired by videos and tutorials on our Paper Sweeties You Tube Channel. Follow us on Pinterest for loads of inspirations and ideas! 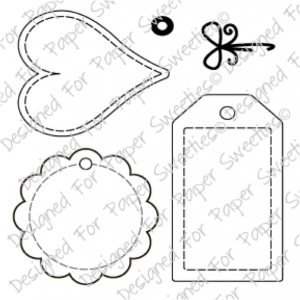 Contact us to pin YOUR Paper Sweeties projects to our Customer Gallery Board! 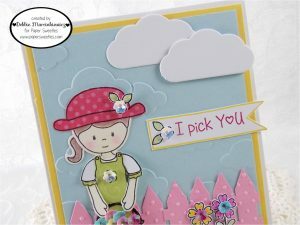 Check Out our Splitcoast Stampers Company Gallery – loads of creativity using goodies from the Paper Sweeties boutique! (Upload YOUR Paper Sweeties creations to this gallery using keyword: papersweeties). GOING, GOING … GONE! A few of our stamp sets have been added to our RETIRING SOON page … check it out and get your favorites at a 40% DISCOUNT before they are gone forever! (Limited quantities … available while supplies last). Follow this blog to stay up to date with everything new and exciting from Paper Sweeties! Until next time, friends, happy stamping! I’ll be back again tomorrow to share one last little something special for the March *NEW* product release … see you then! Paper Sweeties March 2015 Release Countdown! 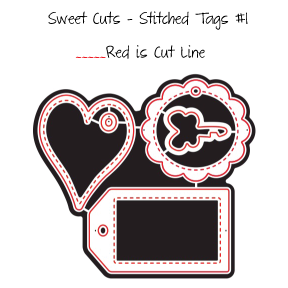 Paper Sweeties March 2015 Release Rewind! Your card is ADORABLE. Thanks for sharing. Grear release. I loVe the Stitched Tag dies. Soooooooo cute cute cute! LOVING the colors, the little fence and those clouds!!!!!!!!!!! What a cutie! Love the basket of flowers and that cute Swiss Dot fence. The added clouds look fantastic–a nice detail! She is a doll!! Perfect card for Spring!! Thanks for joining us at 7 Kids College Fund!